Last week, we were on vacation with the Buegers and Williams in Connecticut. Johnnie’s extended family owns a vacation home on the Thames River. 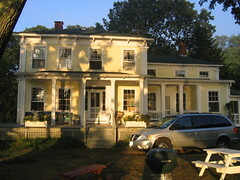 So, we all flew up to Hartford, rented a car, and drove to the house, near New London. We had a very relaxing time! The weather was perfect! A nice reprieve to our Texas summer (one of the hottest on record, I understand). The temperature was in the 70s and 80s during the day and 50s and 60s at night. Very Nice! We ate some great food, took naps, did puzzles, took more naps, did some fishing and boating, went to a museum, visited some friends in New Haven, took some more naps, had campfires almost every evening, and dreamed about the future. Great friends, we are so thankful. Now we’re back, working hard, and gearing up for the fall semester. Another summer here and gone. One more school year (Lord willing). I’m taking Hebrew 3, Preaching 2, OT Prophets, and a Systematic Theology class, “Man, Sin, and Angels.” I’ll also be working on the beginning phases of my thesis. Here we go!